Completing a woodworking project is thrilling, but one thing that can thwart the experience is having the wrong tool for the job. 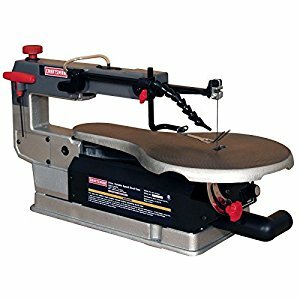 The following Craftsman scroll saw review may help you figure out if this is the right tool for you. What does it mean to be the best scroll saw? In the simplest terms, the saw should be able to handle bevels, hard turns, or those ever-so-maddening enclosed cut-outs. The scroll saw uses the standard parallelogram-shaped blade assembly, which makes it easier to change the blade when necessary. The Craftsman comes with a cast-iron table, which is why the tool weighs 38 lbs. A woodworker knows that more weight means less vibration and quieter cutting. The table does come with tilt abilities. The saw offers a 45 degree left tilt. This allows the Craftsman to easily cut through an inch of material. The saw can cut through two inches of material when it is flat. It should be noted that the tool comes with a dust port. This makes it easy to attach a shop vacuum to remove sawdust, which should make cleaning a lot easier and reduce debris while working. The Craftsman is a versatile saw, which is one reason why many woodworkers use it. The speeds are different so that you can handle other jobs like cutting plastics, hard woods, or soft woods. This Craftsman is not as steady as other saws. The Craftsman does not have the right-tilt feature. Woodworkers who know that they are going to need both right and left tilts may want to consider another saw. The cast-iron table is safe from harm, but some of this saw’s links and attachments can get damaged. Q–What is the stroke-per-minute range? A–The saw’s range is between 400 to 1600 spm. Q–Can it be attached to my woodworking bench? A–Yes. In fact, attaching the Craftsman scroll saw to your woodworking bench reduces the vibration effect even further. This means that your cuts will be smoother, which is important for detailed pieces. A–Yes, the bellows are adjustable. This makes it easier to clear the cut line before continuing with the job. Q–What kind of blades can be Used With the Craftsman scroll? A–Pin-end blades and plain-end blades can be use with the saw, but they must be 5 inches. A–It can cut some soft metals, but these types of jobs might need a specialized tool. There is no doubt that this saw has a few downsides, but they are rectified by its benefits. Plus, it is relatively cheap when compared to other saws without sacrificing quality.